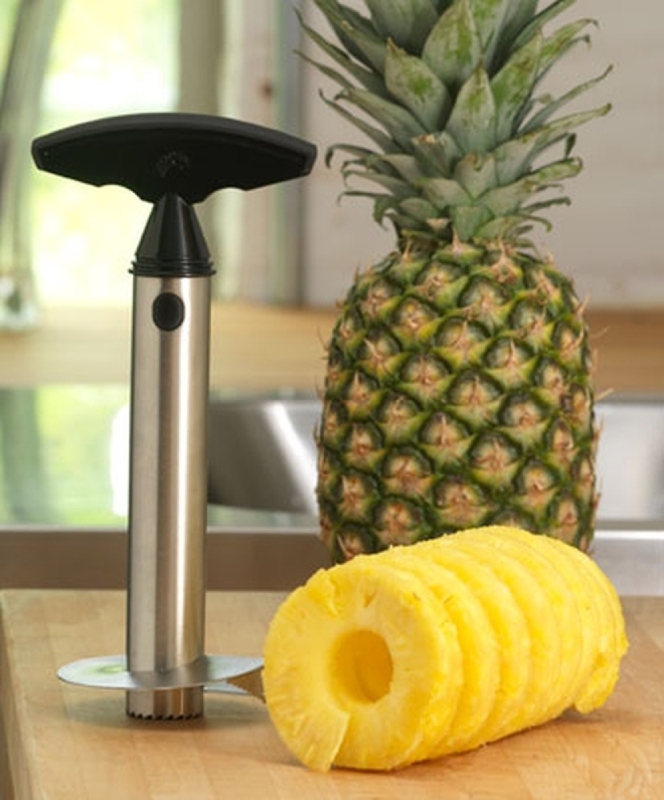 What exactly is a pineapple corer? 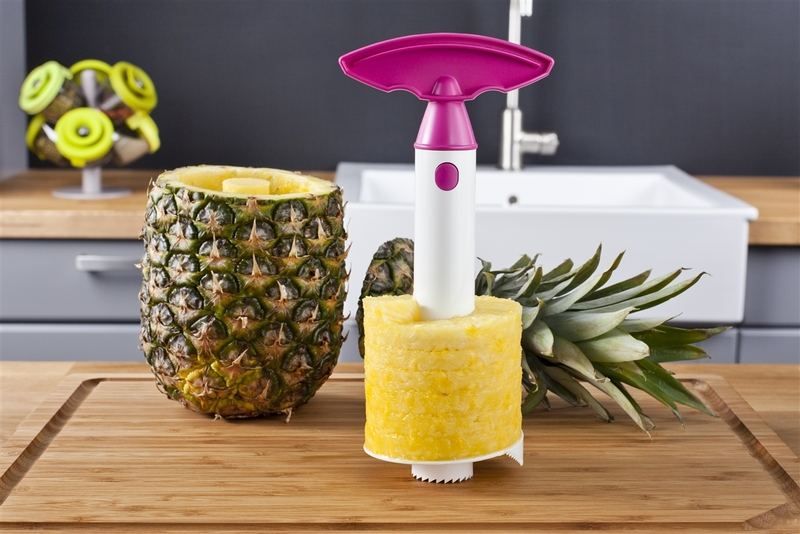 This handy device inserts right into the center of a pineapple and does all the hard work for you. You can find them in plastic and stainless-steel varieties, most commonly ranging from $8 – $20. We highly recommend adding one to your kitchen gadget collection. Cutting a pineapple might not be as easy as the viral pull-apart pineapple, but it does not have to be a daunting task! 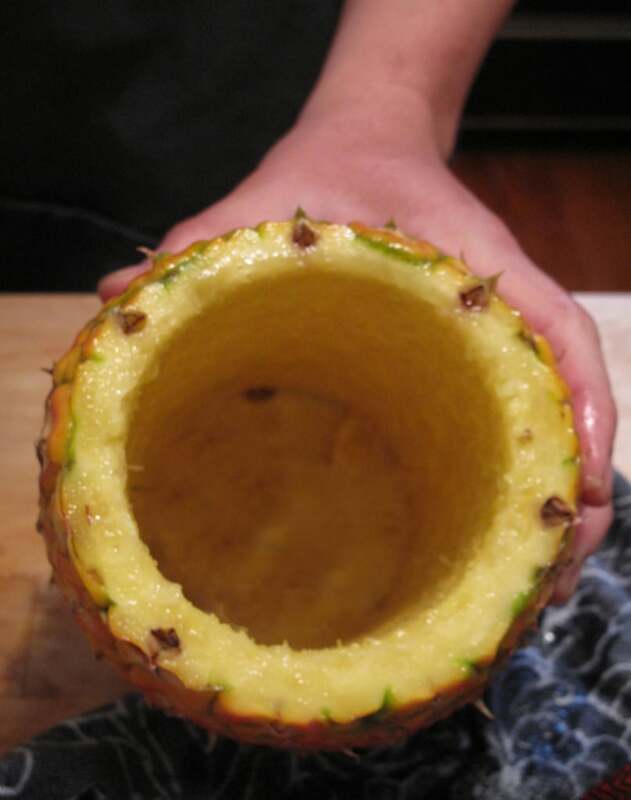 Investing in a pineapple corer makes it quick and fun to slice this prickly fruit. Follow along as we show you how to cut a pineapple with a pineapple corer. Start by carefully slicing off the top leaves of your pineapple to create a flat top. Set the pineapple upright on the cutting board with the flat exposed top facing up. 2. 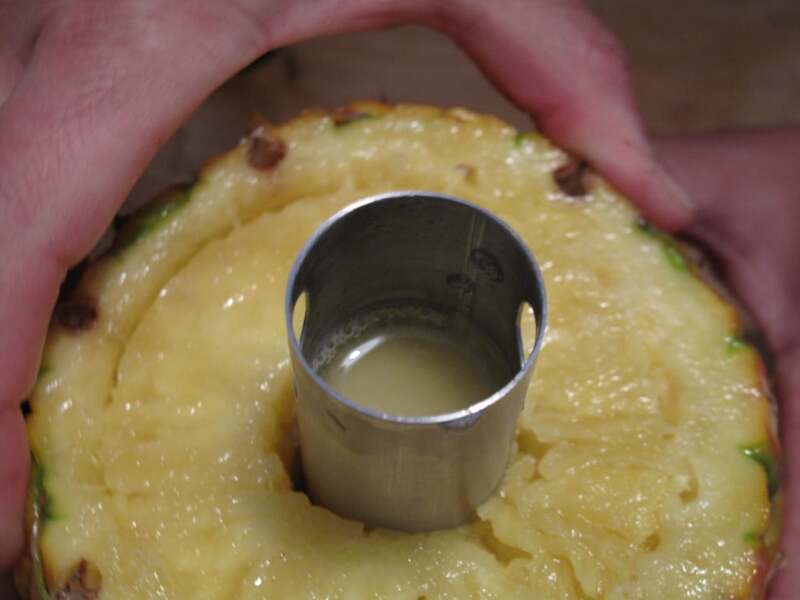 Place corer over the pineapple core. 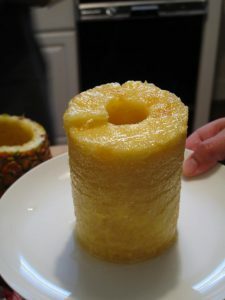 The pineapple core is tougher than the rest of the fruit, which is why it’s typically discarded. Identify the circular core in the center and place the hallow part of the corer over it. Once the corer is in position, start twisting clockwise while pushing down. Keep twisting until you feel resistance, which means you’ve reached the bottom of the pineapple. 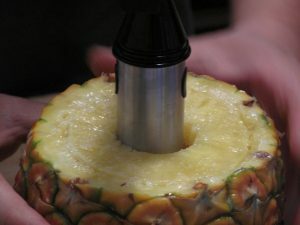 If your pineapple is ripe, the juice should collect in the middle of the corer. Don’t let it go to waste! Once you’ve reached the bottom, pick the pineapple up with the corer still in it and pour the juice into a separate container. 4. Pull up and out. Pull up on the handle of the corer to release the flesh of the fruit from its spiky shell. If you encounter some resistance, wiggle the device to work it up and out. 5. Push the lever and slice. Push the levers on the handle to release the cylinder of pineapple from the corer. 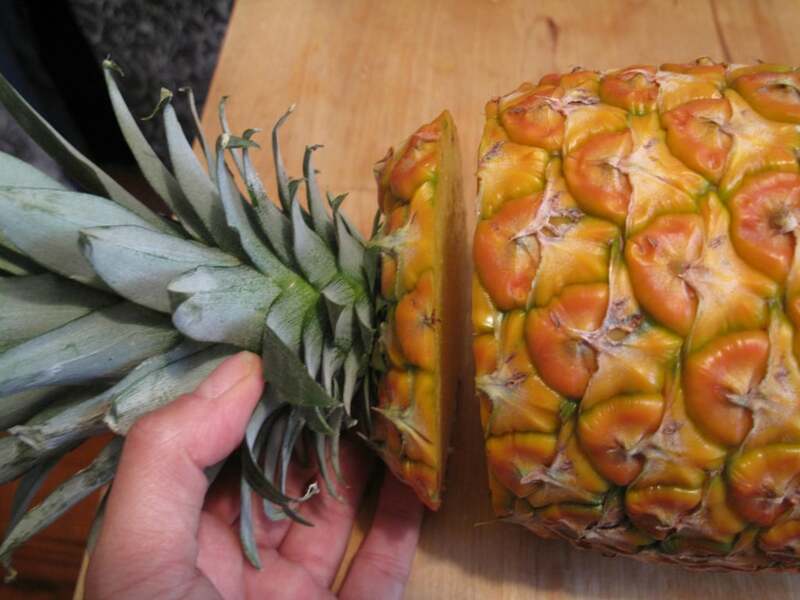 Carefully slice vertically down one side of the pineapple to separate it into rings. Get creative with the empty pineapple shell! Fill it with fruit salad for a beautiful display, or sip a piña colada pool-side. 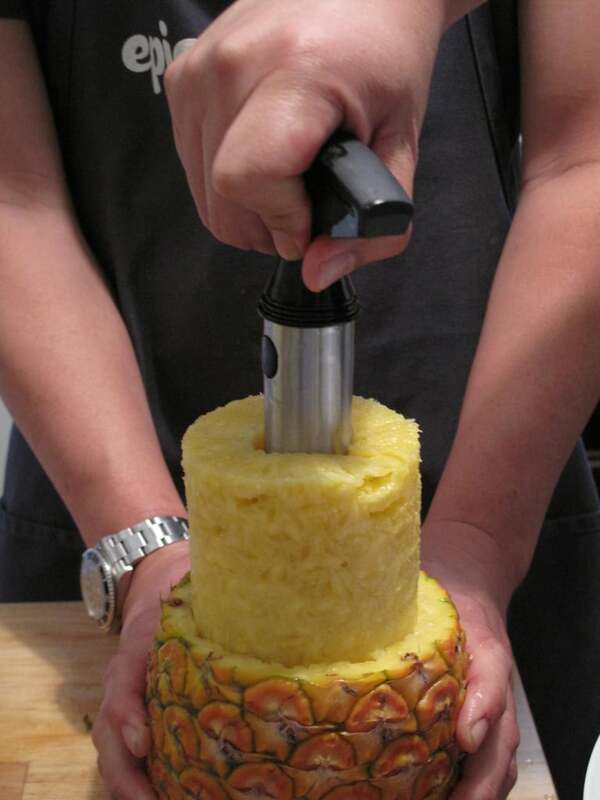 Once you’ve mastered the pineapple corer, the possibilities are endless. Enjoy much more of this tropical fruit for a fraction of the cost of pre-sliced pineapple. Show off the sweet yellow rings at your next dinner party, or chop and freeze to add some citrus to your morning smoothies! 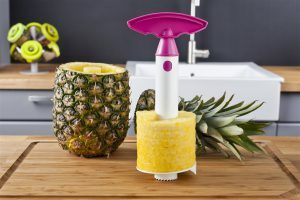 This entry was posted in Featured, Latest News, Recipes, Tips & Tall Tales and tagged DIY, fruit, healthy, how to, how to core a pineapple, how to cut a pineapple, pineapple, pineapple corer, pineapple how to, pineapple recipes, pineapples, recipe. Bookmark the permalink.